Chris Pavesic, author of The Revelation Chronicles, invites you to experience the first novel in the intriguing realm of Chiaroscuro. In a world of steam-powered technology and magic-wielding fae, mystery, intrigue, romance, and adventure fill a series sure to delight fantasy fans everywhere. Did seem to take a long time to build a foundation for story, but quickly escalated into an active, suspension story with a well-deserving ending that could easily support a sequel. The narrator did an excellent performance with good tension and softness where needed. I recommend this production for ages 17+ due to violence. I couldn't say that I favored one character over another. They were all important to how this story flowed. Have you listened to any of Penny Scott-Andrews’s other performances before? How does this one compare? I have not listened to Ms. Scott-Andrews but after having her read to me here that will change. She added to my enjoyment of this book and I can't wait to listen to it again. I would love to be able to listen to the book in one sitting but at least this time around it just wasn't possible. As I was getting toward the end, it had me think about what people used to do before television was around. As a family they would sit around the radio to listen to their favorite programs. Now we have Alexa. I can picture myself asking "Alexa" to play "Undead Quiet" and not moving until the program was over. This is a story that has you thinking about how it would fit into the past. It has me thinking of the GSN program "Steampunk'd" - sadly it only lasted one season. I could picture the contestants designing all the sets and costumes in order to bring Ms. Pavesic's work to life. It's a story that has fantasy, mystery and possibly our future - it shows that nothing is off limits. I thought this author to be very creative especially when you think of how much had to be put into creating the world she's giving us a glimpse into. My disappointment came at the end which left me saying "no, No, NO!" I'm hoping that there will be a follow up to this story so I know what's going to happen - you can't just leave me hanging. Also have to hope that the book is followed up with the audio version and that Ms. Scott-Andrews will continue as the narrator. I was expecting more steam punk which this book has however, it had elves as well as female clergy that are taught to fight. I absoultly loved this book. The author had me hooked from the beginning and I couldn't stop listening to it until the very end. They had me intrigued and surprised me as I kept listening. I kept thinking I knew where this is going but something would happen to change things. I have never come across a book that is a mix between steampunk and elves. I think this is one of reason I really liked it becuase it is new and different. The author puts his own twist on Elves and the world that they and humans live in. I really liked how he used pollution due to human to separate the humans from the elves. This book is violent (just at the beginning) but has no profanity or sexual content. Unfortunately there is no book two out yet. I can't believe a book was written that took all my favorite genres.....it's like a Fandom Mash-up! The story line, the mixing of the Fae (Seelie Court), Steam punk and undead, and Goddeses had my head swimming. It's an excellent first book of a series and I can't wait to see where it goes. I don't feel like the author telegraphed the next few books and I'm grateful for that. I think the book was shorter but that works fine in a series. It's not a stand alone book so be prepared to follow this story for a couple of more books at least. The narration is EXCELLENT. I'm thinking of adding this narrator to my list. I was given a copy of this audible book in lieu of an honest review. Great Start to a Series, Very Enjoyable! I was given this free review copy audiobook at my request and have voluntarily left this review. 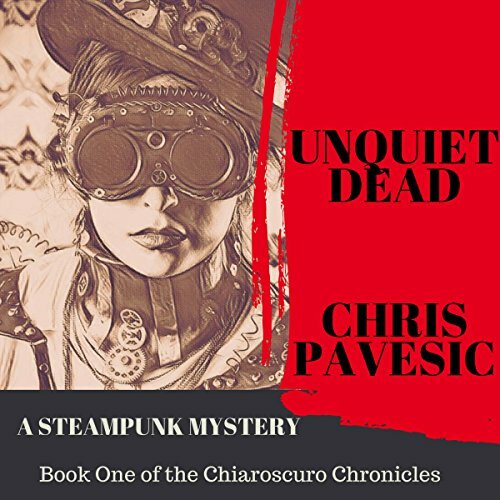 This review is for the audio copy of Unquiet Dead: Chiaroscuro Chronicles, Book 1, by Chris Pavesic and narrated by Penny Scott-Andrews. This was my first steam-punk story. I was greatly impressed. It was a well written story, very good plot and character development. One of those stories that I was plugged into anytime that I could spare. The narrator was perfect for this story. She did a great job with all the voices and her pace and intonation was perfect. I highly recommend this story. Worlds a stage, so little time..
Unquiet Dead is a weird little steampunk story set in mythical Chiaroscuro. The name Chiaroscuro gives you a broad hint of the story's theme. There are mechanical objects running about, but not as many as I have come to expect from a steampunk story. There is a budding romance to add some interest to the tale. Penny Scott-Andrews is a very good narrator. I received a copy of this audiobook at my request in exchange for this honest review. I'm going to say that I found this to be a little hard to get into, and I wish I could say why. The story has a good concept. It's well narrated and the characters are all interesting. It just did not blend together for me. Since the decline in my health a few years ago I've struggled with horror, both on TV and in audiobooks. As a previously avid fan of The Walking Dead I never used to mind a bit of gore, and certainly couldn't be called squeamish. Now, though, my worn-out body can't handle the adrenaline spike I get from imagining having my world torn asunder as it would be in such a terrifying dystopia. So it's fair to say that I knew I was going to struggle to keep going, but it's testament to the richness of the world-building that I was determined to try. Despite a lot of steampunk and cyberpunk elements, this book still felt - to me - more like it was edging towards high fantasy. I'm more familiar with the lighter steampunk/fantasy style of series like The Invisible Library, The Bullet Catcher's Daughter, The Parasol Protectorate, and The Dark Days Club. Seeley court politics, warring factions, elves in flowing robes, and an undead plague in the country weren't really what I was expecting from a 'steampunk mystery', but I think there that the fault was mine. Despite this, the author paints a vivid picture of this alien world, introducing the characters and the lands they inhabit without bombarding the reader with as-yet incomprehensible information. Chiaroscuro grows as we become more familiar with it, and always retains the sense that there is much more to be explored. The narrator, Penny Scott-Andrews, was also an unexpected revelation. Initially I wondered how well I would settle into her voice, (and particularly the hard 's' sounds that jumped out at my fractious nerves as I lay in bed, listening to this book instead of putting away the Christmas decorations and finding a home for 26 new toiletry gift sets...). Soon her spirited performance outshone my initial qualms, and the lively way she throws herself from character to character, traversing multiple accents and contrasting personalities won me round and kept me listening to the end. Though this turned out not to be quite "my" kind of book, it was entertaining and well crafted, and I would recommend it to fans of horror or high fantasy who would like to explore steampunk novels but aren't sure where to start, or who have found other examples to be too lightweight. *I received this audiobook free of charge in exchange for an honest, unbiased review.